The image on this fake passport was apparently the passport photo of actress Laura Vandervoort's character on the TV show "V."
Prosecutors say an international identity-theft ring is believed to have roped in hundreds of victims and millions of dollars, even co-opting the image of a Hollywood actress for a fake passport. Four people were arrested Thursday, including two from Virginia. Prosecutors are still determining the scope of the scheme. They say the ring engaged in multiple scams, creating fake companies to conduct bogus job interviews where the criminals harvested applicants' personal data. The ring also scoured the internet for mugshots that could be plugged into fake IDs. 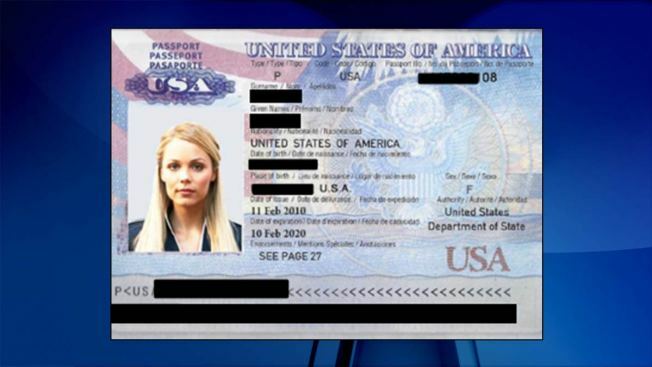 Joshua Stueve, a spokesman for the U.S. Attorney's office in Alexandria, said one document used a photo of actress Laura Vandervoort from the TV show "V" on a fake passport. Investigators said using a recognizable actress' image helped expose the scheme. In one scam, victims replied to a phony job ad on Craigslist. Applicants were asked to provide Social Security numbers, drivers' licenses and passports. Their identities were then used to set up shell companies, and an inside employee at American Express in India provided stolen credit card numbers which were processed through the shell companies, the FBI said. A second scam involved fraudulent cheap travel ad. The scammers advertised cheap airfare and hotels on YouTube and Facebook, according to the FBI. The victims paid for travel tickets, and the shell company paid for the travel using stolen credit cards, keeping the victims' money. In a third scam, the suspects are accused of over-billing an Ashburn, Virginia company. The FBI says the scammers were working with an employee of the company to submit inflated invoices from shell companies. The suspects allegedly stole $2.4 million just from the over-billing scam alone, the FBI said. People who believe they may have been affected by this alleged scheme are asked to submit their complaints online at www.ic3.gov, and include the keyword "CCTRAVELVICTIM" in the "description of the incident" field.